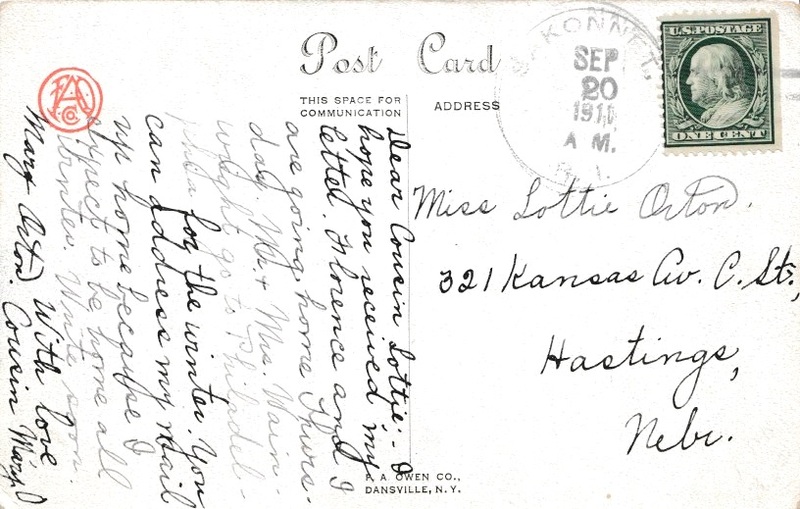 in 1911 Lottie Orton of Hastings, Nebraska, received a postcard from her cousin Mary Orton of Fall River, Massachusetts. The question is, can we find any more evidence that Lottie and Mary's fathers were brothers? In 1941, Mrs Martin Lynch of Port Jefferson, Long Island, received a letter from the town of Sligo, County Sligo, Ireland. 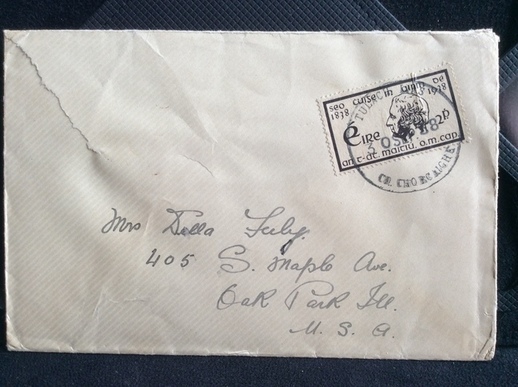 Can we identify Mrs Lynch, and can this envelope help us find her county of origin in Ireland? In 1941, Mrs. Felix Tarsney of Glen Ridge, New Jersey, received a letter from Gaillimh (Galway City), County Galway, Ireland. What can we learn about Mrs Tarsney? Was she from Galway? In 1937 Miss Katie Timoney of 654 Lincoln Avenue, San Rafael, California, received a letter from Ballyconneely, County Galway, Ireland. Did this correspondence have anything to do with her family's county of origin in Ireland? On September 30, 1938, someone in Tullylease, County Cork, mailed a letter to Mrs Della Feely, 405 South Maple Avenue, Oak Park, Illinois. Did this letter come from a relative in Ireland? If so, can it help us trace back Mrs Feely to her county of origin? 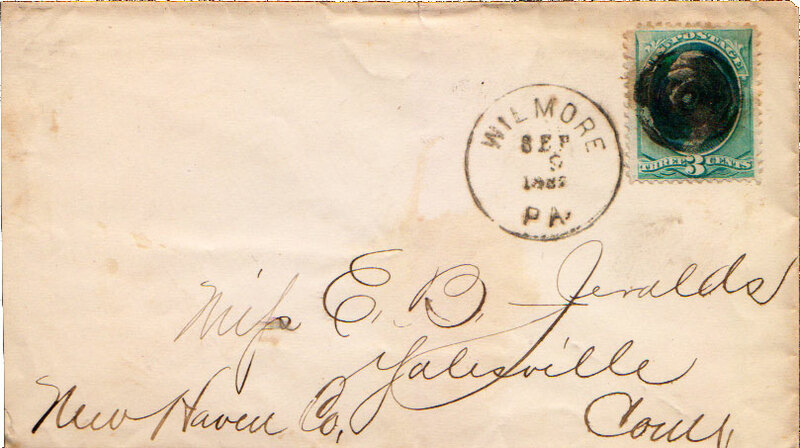 In September 1882, Miss E B Jeralds of Yalesville, Connecticut, received a letter from someone in Wilmore, Pennsylvania. What can we find out about Miss Jeralds and her correspondent in Wilmore? 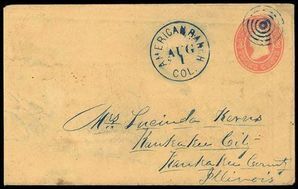 About 1863, Mrs Lucinda Kerns, of Kankakee, Illinois, received a letter from American Ranch, Colorado. Who was Lucinda Kerns and whom might she have known in American Ranch, Colorado? 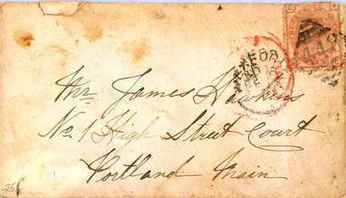 In 1871 Mr James Hawkins of 1 High Street Court, Portland, Maine, received a letter postmarked in Wexford, Ireland ... Who was James Hawkins and does this postmark tell us anything about his place of origin in Ireland? In about 1863 Mademoiselle Lillie B. Chase received a letter from Vienna, Austria, sent in care of Saml. B. Chase, Esq, of Valley Falls, Rhode Island. The letter was addressed to Mlle. "Chase" although the family spelled the name "Chace." Having found William McGrath's parents, James McGrath and Margaret Penn, I decided to look for parents. About March 1943, Miss Mary Keane of 93 Fox Hill Road, Nahant, Massachusetts, received a letter from Gaillimh (Galway) Ireland. 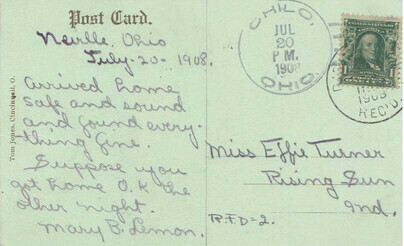 Can this postmark tell us anything about her family's Irish origins? In the 1940's, Mrs M G Lavin of 179 East 32nd, Brooklyn, NY, received a letter from Co. Roscommon, Ireland. The name of the post office is unreadable. Can we identify Mrs Lavin? Did she come from Roscommon? 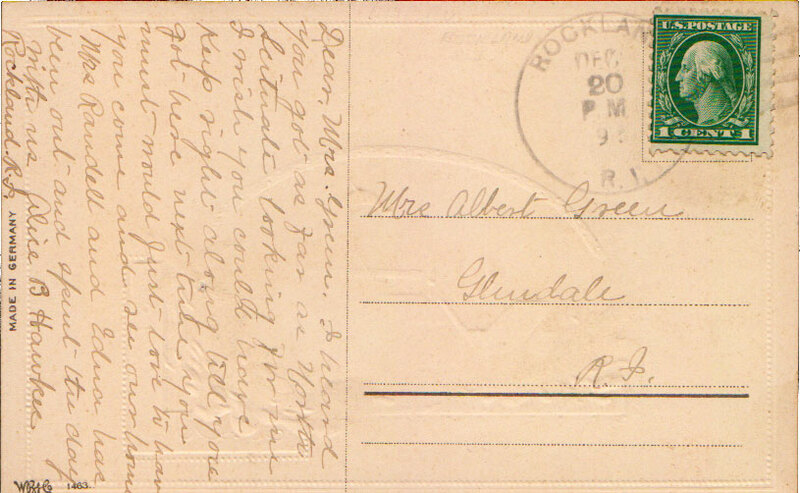 In November 1906, Miss Carrie I Martin of Rochester, New York, received a postcard from Miss. J.C.V. 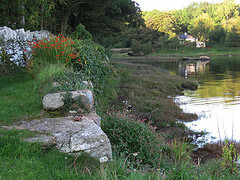 Moore, of Tamney, Letterkenny, County Donegal, Ireland. 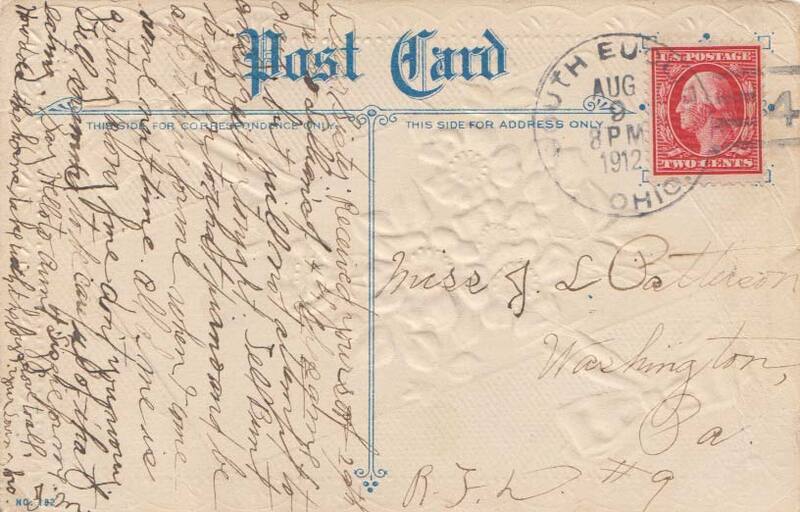 Can this postal cover tell us anything about Carrie Martin's ancestry? What can we learn from the online records? 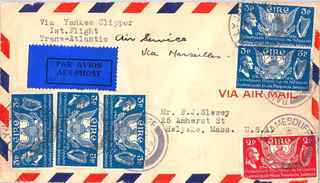 In 1947 Mrs N J Gibson, of Rye, New Hampshire, received a letter postmarked CeannToir (Kanturk), County Cork, Ireland. Can this letter help us identify Mrs Gibson's Irish county of origin, if any? I came across P.J. Slowey while looking through some postal covers at the Jim Forte Postal History site. In 1939 he received a letter from Ballyjamesduff, Ireland. As a genealogist I wondered if that was his place of birth. 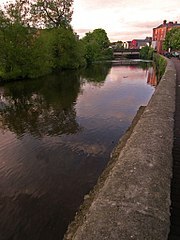 In 1910, Richard G Powell of Oakland, California, received a letter from Nenagh, County Tipperary, Ireland. It was sent in care of Matthew Ryan, at 487 Moss Avenue. 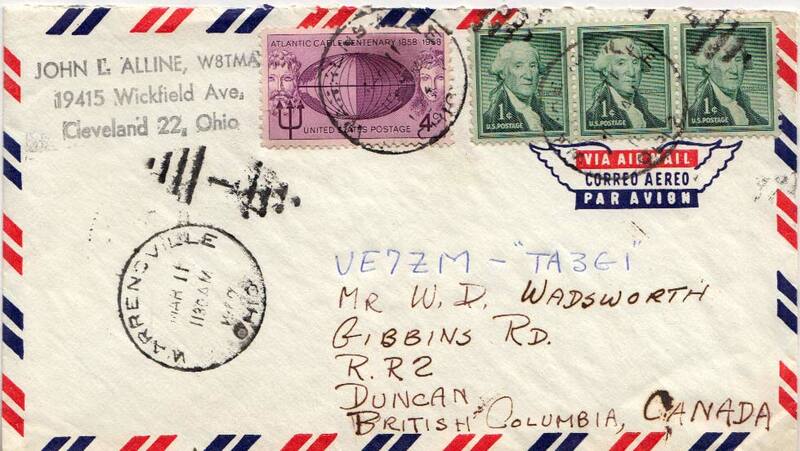 Can this envelope help us determine Richard's county of origin in Ireland, if any? 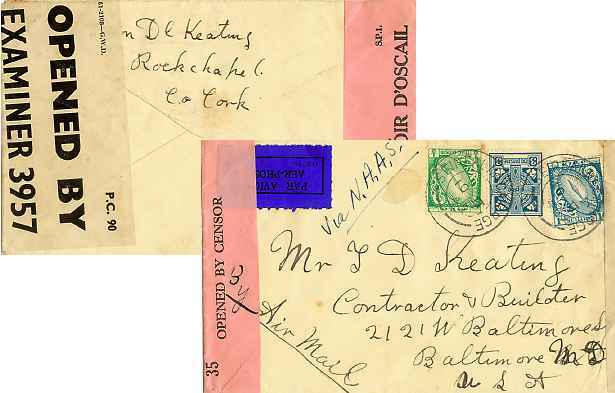 In 1942, Mr Jim T. D. Keating of 2121 West Baltimore Street, Baltimore, Maryland, received a letter from D. C. Keating of Rockchapel, County Cork, Ireland ... Can this postmark and letter help us locate Mr Keating’s origins in Ireland? 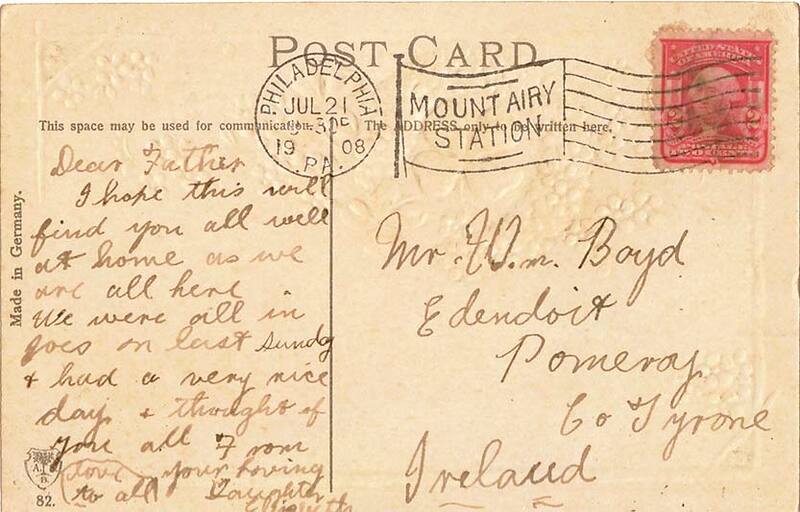 In March of 1936, Mr. William McGrath of Butte, Montana, received a letter from Ennis, County Clare, Ireland. It was addressed to him c/o the Post Office, and there was a stamped note on the envelope that said "Second Notice." What can we learn about Mr McGrath? Was he from County Clare? 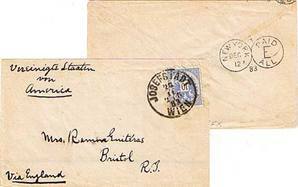 About December 1883, Mrs Ramon Guiteras of Bristol, Rhode Island, received a letter from Vienna, Austria. Who was Mrs Guiteras, and whom did she know in Vienna?